While not as easily or frequently found as in the past, old world quality and craftsmanship driven by devotion, is not lacking today in North America. There are hidden gems, studios and firms of traditional Catholic art of various forms, remaining practically unknown. Sometimes these are not recognized, simply because the artist has not resorted to the most current means of self- marketing. Whether or not an aggressive social media or strong online presence is necessary today is for others to dispute. But, in this case, I am glad to bring to light a studio doing work of remarkable quality, for the beauty and dignity of the Sacred Liturgy by way of linen. 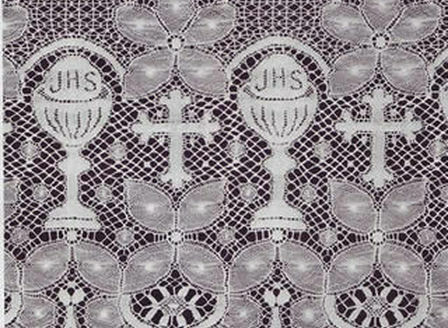 Traditionally, Holy Mother Church has prescribed that sacred linens (corporals, purificators, palls, as well as finger towels), altar cloths and some vestments (amices and albs) be made of 100% linen. This is not only because Almighty God deserves the best, but He has commanded the best. The Roman Ritual’s blessing for altar linens refers to the Divine orders for various liturgical appointments, including the use of linen. (See Exodus, chapters 26-28.) Following His Crucifixion and Death, Our Lord’s Body was wrapped in fine linen. (Mark 15:46). Saint John wrote in his Apocalypse of seeing angels clothed with clean and white linen. (Apocalypse 15:6). These are by no means the only mentions of linen in Sacred Scripture. Unfortunately today, in many (if not most) parishes and chapels, cotton and polyester have replaced linen and hemp. “Sacred linens” and altar cloths of unworthy material are now hastily ordered – often only as an afterthought or when absolutely needed. 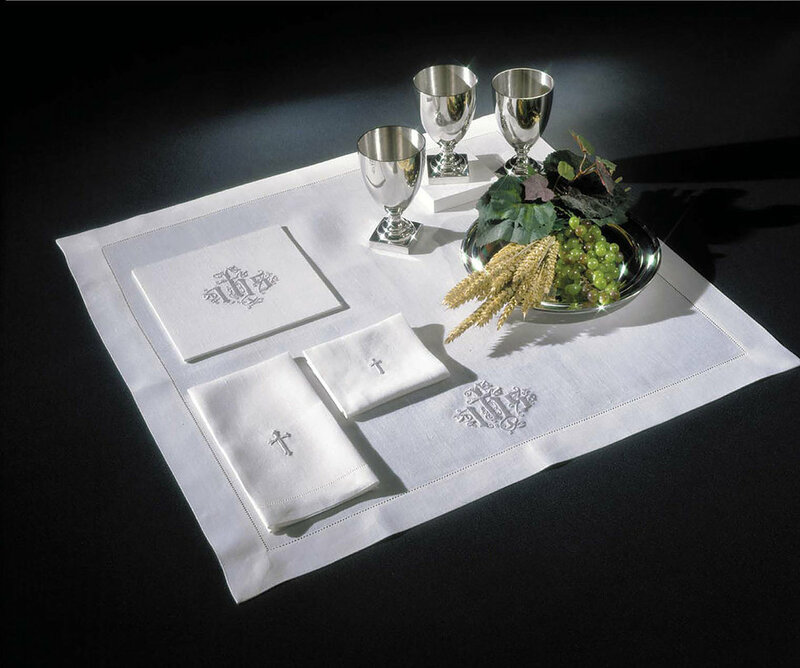 Many priests may not give a second thought to utilizing these "profane" linens at their Mass, or disinterestedly use what is already present at their assignment. 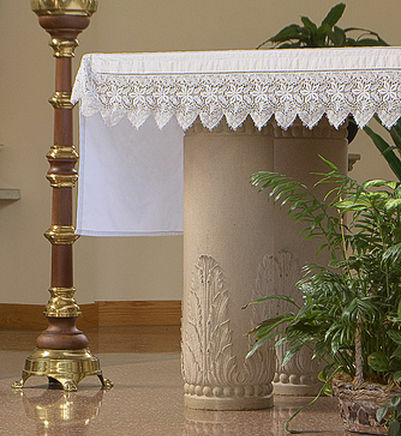 Other pastors, sacristans or church secretaries may consider true linen altar cloths or sacred linens, but then dismiss the idea after seeing unreasonably high prices in catalogues or online. Happily, there is an alternative: sacred linens and altar cloths of 100% fine Irish linen, are being produced in the United States, and more surprisingly, at affordable prices! Producing hand-cut, hemstitched and embroidered linens and altar cloths, Details in Design is Williamsburg, Virginia’s hidden secret. 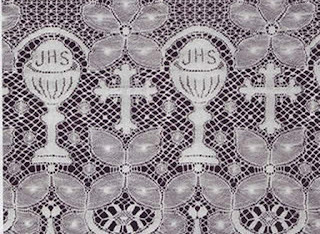 The studio also sells fine linen French and Roman albs and surplices, as well as embroidered albs, and lace for the altar and albs. The firm is virtually unknown even to traditional Catholic priests who daily use integral linens, but are hard-pressed to find a good source for these. As an experienced sacristan and M.C., I can attest to both the beauty, the high quality and the affordability of Details in Design’s products. Although a business, Details in Design is a smaller labor of love, run by those interested in the greater glory of God, through the worthy celebration of the Sacred Liturgy. The staff are committed to providing only the best material and work to achieve this purpose. Details in Design also offers classes at the Williamsburg School of Needlework, for those interested in the production of sacred linens (intensive courses, as well as shorter workshops) as well as basic embroidery, whitework, and hemstitching. The firm welcomes enquiries from experienced embroiderers, interested in assisting (even remotely) in the production of sacred linens and altar cloths. Details in Design should become (much) better known in Catholic circles, among the clergy and laity interested in the dignified celebration of the Holy Mass, in the vesture of the chalice, the altar and the sacred ministers. The beauty and mastery of its pieces are only matched by their most reasonable prices. For more information, visit: www.communionlinens.com. B.A.Y. is a contributor on various Catholic publications and websites and lives in the United States.